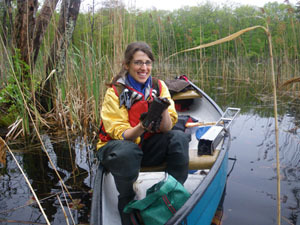 Dr. Julia G. Lazar holding a recently collected subaqueous soil core on Pond C, along Roaring Brook in Washington County, RI, USA. Cores were extracted with the metal soil corer from the canoe, wrapped and transported back to the University of Rhode Island for mesocosm experiments. Beavers, once valued for their fur, may soon have more appreciation in the Northeastern United States. There they are helping prevent harmful levels of nitrogen from reaching the area’s vulnerable estuaries. By creating ponds that slow down the movement of water, they aid in removing nitrogen from the water. Nitrogen levels have been increasing in Northeast waters for years. The use of nitrogen fertilizers has risen and urbanization has brought in influences such as septic systems. This nitrogen is released into small streams and ponds and eventually travels to estuaries, where rivers meet the sea.